Seeing as the expo opened with one full version, it may only make sense to end the 2009 SAGE with another. Originally scheduled for release today, it appears Sonic Rebirth will see a one day delay, and will be available to the masses tomorrow. 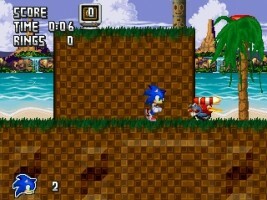 You may recall that Rebirth intends to visually update the original Genesis and Game Gear/Master System stages from the 1991 Sonic the Hedgehog. A site update problem seems to behind the lag, according to our news tipster, who sent the information in. In anticipation of the release, we have the final promo trailer released for the game. Dated July 10th, it doesn’t appear we nor anyone else have posted the trailer previously. Look for a complete review of the full edition of Sonic Rebirth here on TSSZ News as we wrap up our SAGE coverage this weekend.